With an effective online booking and reminder system, business can save valuable time and increase sales by 30%. Since customer can book their service online by themselves 24×7, and with the scheduled SMS and Email reminder, it will reduce the appointment no-show by 50%. 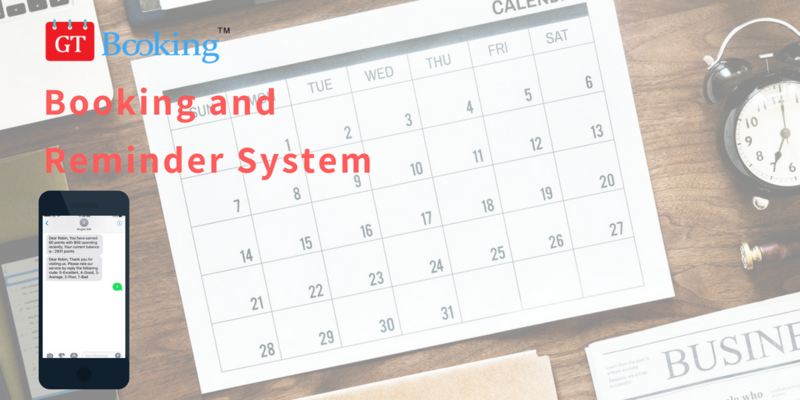 GT Booking and Reminder System is a perfect solution for business to setup their own booking and reminder system, and start improving their service immediately. 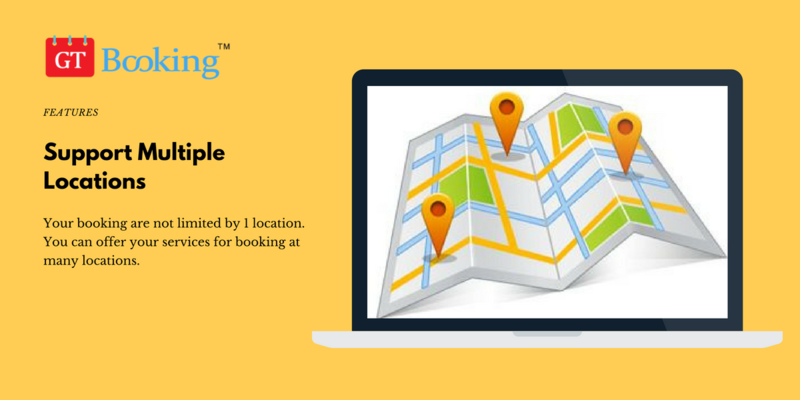 Some of the booking systems only cater for one business location, that will limit booking service capabilities when business has multiple branches. With supporting multiple business locations in mind, GT Booking and Reminder system makes business expending to multiple branches easily without changing the booking system. 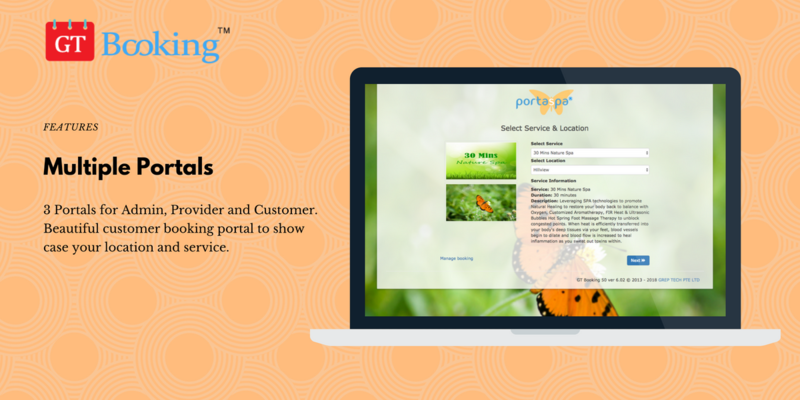 GT Booking and Reminder system is designed with flexibility to adapt to many different service industries. 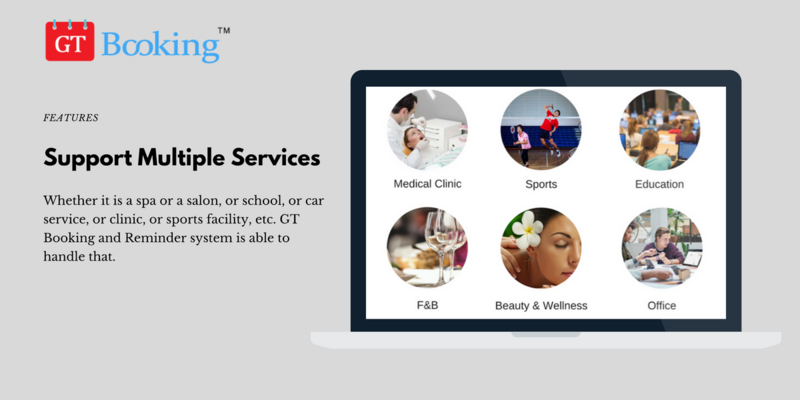 Whether it is a spa or a salon, or a school, or a motor service center, or a clinic, or a sports facility, GT Booking and Reminder system is able to handle the booking and reminder for the business. 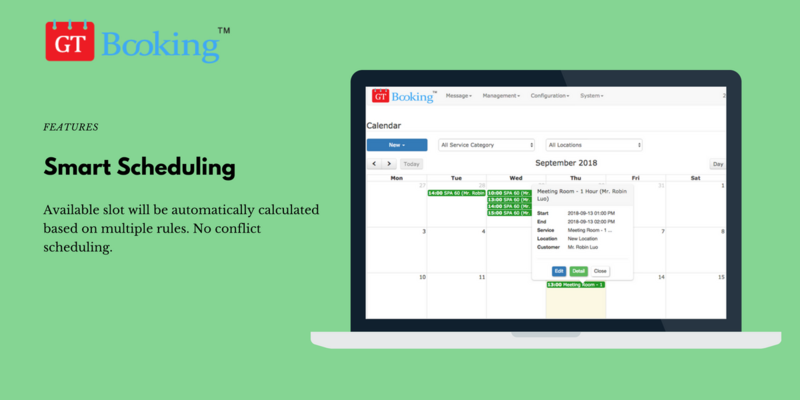 With the build-in smart and dynamic scheduling algorithm, GT booking and reminder system checks the service available slot automatically, based on working days, break time, busy time, previous bookings, service capacity and comes out the available slot. That helps business to optimise the resource utilisation without over booking. 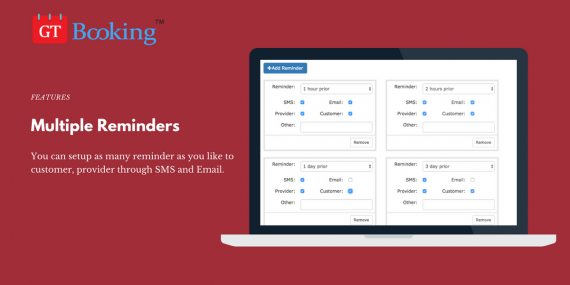 GT Booking and Reminder system supports both SMS and Email reminders, it can send multiple reminders to customer, provider as well as location admin at predefined schedule before the appointment, that will greatly reduce the appointment no-show. 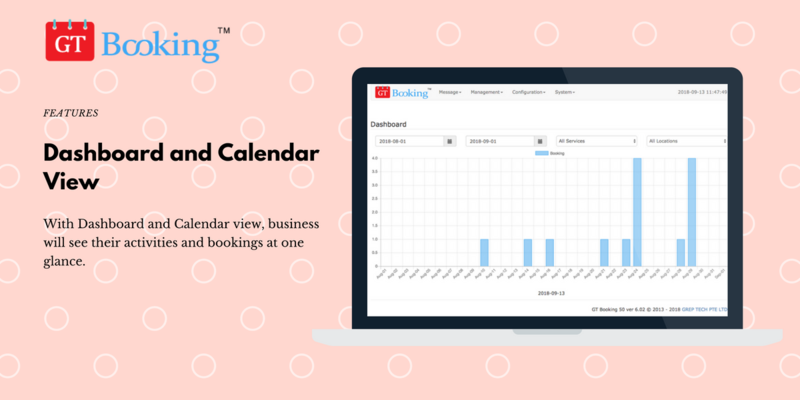 Through Dashboard view and calendar view, business can have a clear picture of their activities and easily to schedule their resource to cater for the demand. 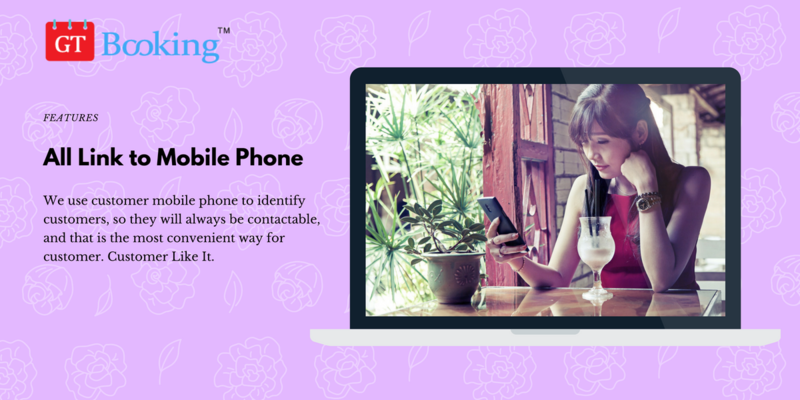 With popularity of mobile phone usage, GT Booking and Reminder system is using customer’s mobile phone number as their customer ID, and that makes the communication with customer much easier and effective. This probably is one of the most powerful features of the GT Booking and Reminder system! 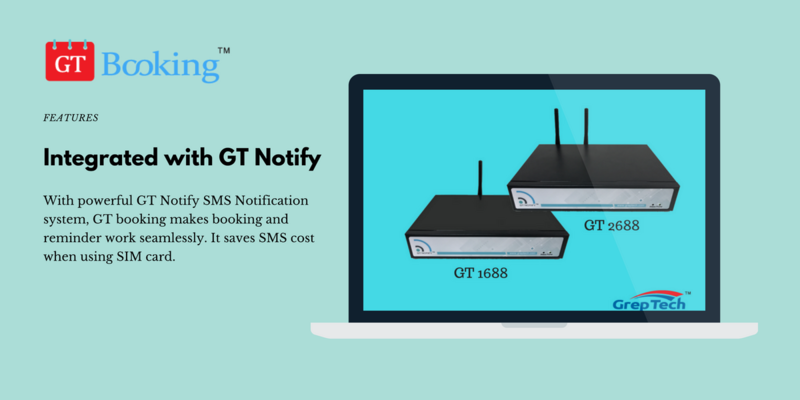 GT Booking and Reminder system runs on top of GT Notify SMS Notification system, and utilises the powerful SMS features, that makes it a power tool for business to conduct online booking, scheduling, reminding, as well as marketing.